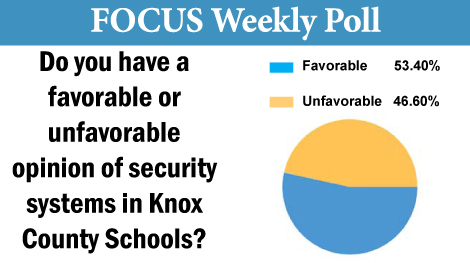 This week’s Knoxville Focus poll posed the question, “Do you have a favorable or unfavorable opinion of security systems in Knox County Schools”? Overall, just over 53% say they have a favorable opinion of the security systems in our schools. Those in the 30 – 65 age groups were almost evenly divided, with the margin for a favorable opinion coming from those voters 65 and older. A solid 55.71% of seniors said they have a favorable opinion of school security systems, while only 50.94% had a favorable opinion in the 30-49 age group had a favorable opinion. Amongst those 50-65, it was slightly less, with 50.40% having a favorable opinion of school security systems. Inside each of the nine Commission districts, a favorable opinion prevailed in all but two; the Sixth District, which is based in northwest Knox County, saw 53.85% saying they had an unfavorable opinion of the school security systems. The Ninth District, which is South Knoxville, registered an almost identical percentage, with 53.49% of respondents saying they had an unfavorable opinion of school security systems. The district with the highest percentage registering a favorable opinion of school security systems was the First District, with just over 66%. The Fourth District, which is centered around Sequoyah Hills, was almost even divided with 50.94% saying they have a favorable opinion of school security systems. Obviously Knoxvillians and Knox Countians are deeply divided on this issue.